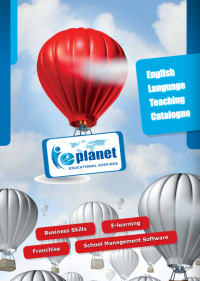 Here at E-Planet we have been working on launching our new catalogue and we are pleased to say that you can finally take a look at it here: E-Planet Educational Services Catalogue. Inside you’ll find information about all of our products. From children’s and adult’s books for learning English to workshops and seminars. Plus we’ll also give you a glimpse into the future of E-Planet Educational Services as we showcase what is coming next for us and how we can help you on your language learning journey whether you are a student or an educator.